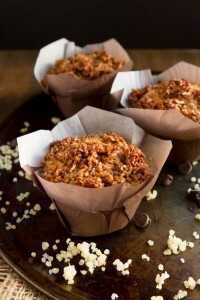 Gluten-free muffins made with roasted sweet potato and chocolate chunks. Topped with a maple-infused quinoa crumble topping. Preheat oven to 350°F. Line a muffin tin with six paper liners. To prepare crumble: Add all ingredients to a bowl. Stir to mix, and throw in the fridge until ready to use. In another smaller bowl, whisk together the wet ingredients. Pour the wet into the dry and mix until just combined. Stir in the dark chocolate. 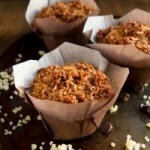 Spoon the batter into 6 muffin cups. Remove crumble from the fridge and break up with a fork. Top the muffins with the crumble. Allow to sit in the pan for 2 minutes. Remove from the pan and transfer to a cooling rack for 30 minutes.